The Camp Echo Lake Health Center is truly a place to keep and get kids healthy. Staffed 24 hours a day, 7 days a week, the medical staff consists of a doctor, eight nurses and an administrative assistant. The Health Center strives to make sure that all children and staff members at Camp Echo Lake are healthy so that they can have the best summer of their lives. We not only help children and staff who have a medical problem, but also try to ensure that all kids are staying healthy by avoiding dehydration, performing safe activities and getting all medications sent to camp by their families. The Health Center is always open for any medical concern, and campers are welcome to come in anytime with a staff member if they have a problem. The on-camp physician has a morning and night call time, when any and all campers and staff can come and be evaluated by a doctor. The doctor is on camp 24 hours a day, and is available for emergencies at any time, day or night. 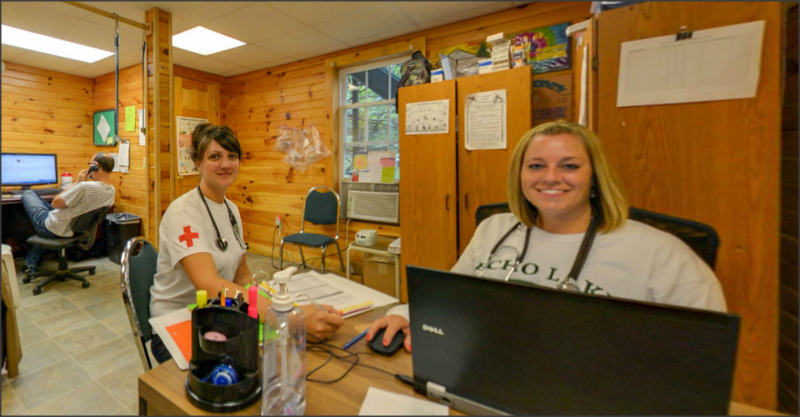 The Health Center also has multiple medication calls throughout the day where campers come to receive any prescription or non-prescription medication quickly and efficiently so that they can get back to enjoying all of the amazing Echo Lake activities. The Health Center strives to communicate problems or concerns early and often with all parents by phone or email. Anytime that a camper stays overnight in the Health Center, a call will be made to his or her parents to let them know why, and what we are doing to take care of their child. Parents will also get a call from the camp doctor every day that their child stays overnight in the Health Center. Children often stay in the Health Center if they have a fever or vomit, or if any other concern comes up. Similar to school rules, we keep children in the Health Center until they are fever-free for 24 hours. While in the Health Center, campers can enjoy watching DVDs, play with the nurses who act as surrogate moms giving out lots of hugs and attention, get visits by their counselors and head staff, read books, listen to music and enjoy the Health Center air conditioning and private showers. Doctors will call parents before writing any prescription medications for things like ear infections, strep throat or anything else that may come up. These medications are delivered directly to camp, and we make sure that campers take all recommended doses. Although we do everything possible to avoid them, Camp Echo Lake is also well-prepared for major medical problems. All staff members receive training on how to respond to an emergency on camp, and AEDs are positioned all around the camp. The Health Center staff also has additional medical emergency equipment available that they can bring to the site of any emergency including: oxygen, splints and bag valve masks. The Warrensburg Health Center is a five minute drive from camp, and the Warrensburg Emergency Medical Services can typically have an ambulance to campus within 5-10 minutes. Finally, we are 20 minutes away from Glens Falls Hospital and 60 minutes from a major children’s center – The Duker Children’s Hospital at Albany Medical Center. (see We Are Closer Than You Think). The Health Center is a wonderfully loving place where we strive to get and keep kids healthy so that they can grow, learn and have the best summer ever at Camp Echo Lake!